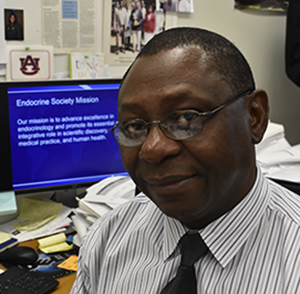 Dr. Benson Akingbemi, a professor of anatomy and developmental biology in the Department of Anatomy, Physiology and Pharmacology in Auburn University’s College of Veterinary Medicine, has been named to a three-year term (2017-2020) on the Research Affairs Core Committee of the Endocrine Society. As a committee member, Dr. Akingbemi will help identify emerging research opportunities and develop strategies for promoting project priorities to funding agencies. His first assignment is to participate in the Society’s “Hill Day” on March 15, in which members meet with congressional representatives at the Capitol to advocate increased research funding, including for the National Institutes of Health (NIH). The 100-year old Endocrine Society is the largest global membership organization representing professionals from the field of endocrinology. Membership is comprised largely of academic professionals, medical doctors and scientists. Society members represent 122 countries, with its headquarters in Washington, D.C.
Dr. Akingbemi joined the CVM faculty in 2004. He received the DVM, Master of Science and Ph.D. degrees from the University of Ibadan, Nigeria. Beginning during his postdoctoral training, he has worked in the areas of molecular toxicology, investigating the effects of environmental agents on male reproduction for more than 20 years.